I know my photography skills are not the greatest, I don't get artistic and frameable shots like Amy or Alicia, but all throughout the Year of Color 1 and 2, I do try to only take photos of things that are meaningful to me and my family in some way. So I was going around the house tonight, last minute as usual, trying to shoot things like the ducks in the bathroom, the eggcups that come out at Easter, but nothing really special. I downloaded them onto the computer, and along with the dozen or so shots I'd just gotten of static, forced yellow + black, it just so happened that our celebration dinner last night fit the bill perfectly. It was so much fun (except for the fact that I had hives and an allergic reaction from something earlier in the day - but ignore that part). 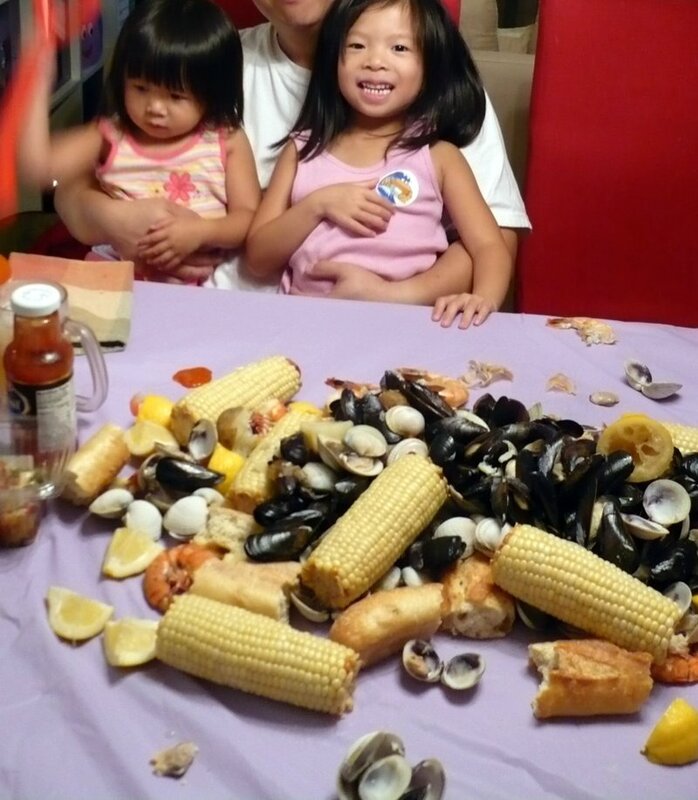 Thanks to Cindy, who never fails to come up with the greatest ideas, we had a utensil-less, plate-less, messy, amazing shrimp boil, plus mussels and clams, all washed down with Martinelli's Sparkling Apple-Mango and Apple-Cranberry Ciders. Happy First Week of Kindergarten, my dear, and here's to yellow + black! I thank you for the comments on my photos (and to be mentioned in the same breath as Alicia P. is pretty humbling -- but I applaud YOU for a wonderful effort at a celebratory dinner. How fun for your girls -- a very special treat. Your year of color and color+color submissions are always thoughtful and true to your life - and I really appreciate that. Oh my gosh, hives? What a bummer! Yummy! And congratulations to Rebecca on being a big kindergartener! Wow! Plateless! Easy clean-up...how wonderful. Yay! Hurray also to Becca for joining the ranks of school goers everywhere. One more year for us and all 3 will be in school, time flies.